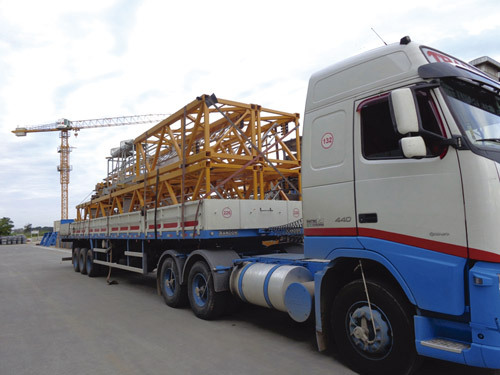 As other machines of large size, these cranes demand a thorough operation of transport and erection to attend project’s needs. See how it is carried out. Lifting and horizontally moving heavy loads of materials such as steel and concrete in high places, tower cranes—or gruas, how they also are known due to the French word grue—are a fundamental solution for construction works. Due to their features, these machines allow projects to be carried out easier and faster. But since they are complex and bulk structures, the main obstacle to use them is transporting the components to the worksite, many times too far from the place where the equipment is stored. At this point, a description is important. 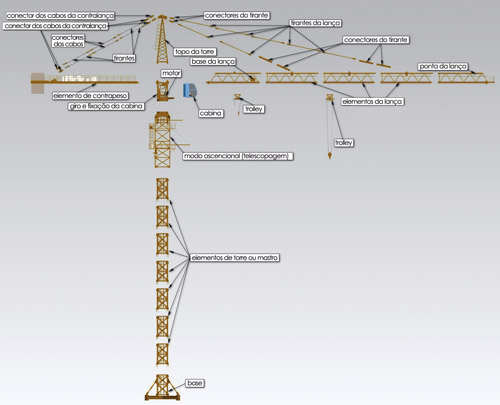 As is well known, a tower crane is composed by several parts. Among the main parts is the base—built in concrete—that may be 10 m long and more than 1 m deep. This base will support the whole structure of the equipment through anchor bolts deeply fixed in the concrete. The second part is the tower, which defines the working height. The third is the boom, which has a trolley with pulleys that travels along its length. It is the part that supports the load. There is also a horizontal shorter boom in the opposite direction, where the concrete counterweights are positioned, together with the motor and the electronic system of the machine. The swing platform and the operator’s cab are also parts of the structure of this family of cranes. Most conventional cranes have its maximum height of 80 m with no load. This height may be higher but in this situation the equipment has to be fixed in the building as its structure is erected. Normally the reach is 70 m and the maximum load to be lifted is approximately 19 t, using a 20-t counterweight. A detail to be observed is that the closer the load is from the tower, the higher will be the load that may be handled safely. Nevertheless, the expert tells that there was a situation where—in addition to trailers—supply boats that give support to oil platforms were used. “In this case, the crane had to be placed in containers in accordance with the sequence of erection and be accompanied by a thoroughly detailed packing list that would inform exactly to the erection team which container would be opened next to continue its work”, explains him. For these reasons, some large manufacturers carry out a more detailed strategy that includes the transport planning design into the manufacturing project. This is the case of Liebherr, whose equipment is built—since its design—to optimize transport in trucks or containers.